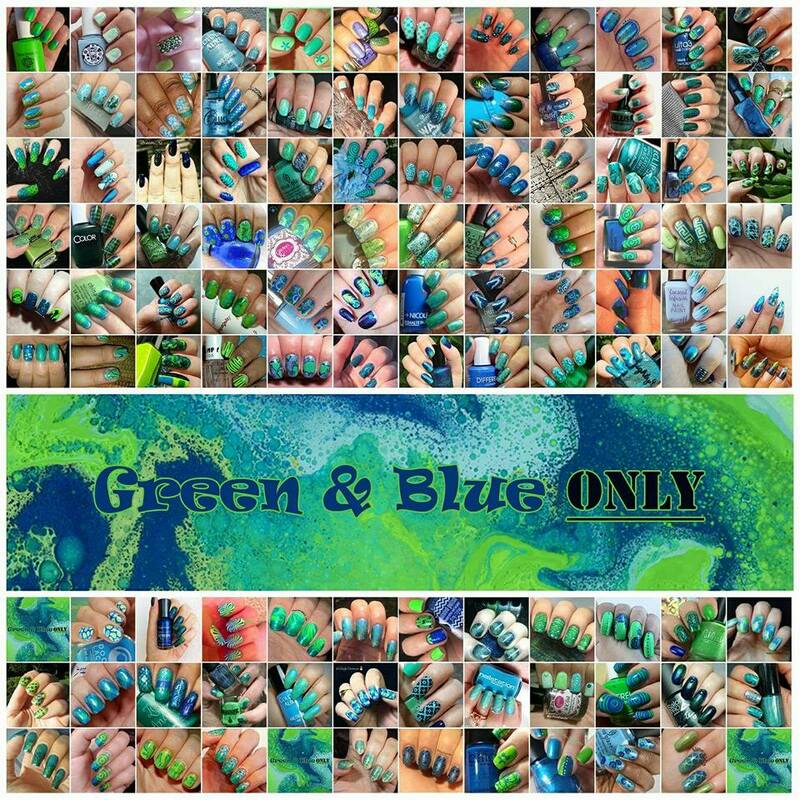 When Colors Collide: blue & green nail art | Light Your Nails! Che ne dite di cominciare la settimana con una nail art? E poi è Ferragosto, restiamo in tema acqua e secchiate? Almeno coi colori. Oggi infatti mi unisco di nuovo al gruppo When Colors Collide per un post a tema, in questo caso una nail art con solo verde e blu. Ho creato una base sfumata con due smalti olografici Colour Alike, l’azzurro mare 512 e il verde acqua 513. Poi ci ho stampato sopra, con un blu più scuro, due immagini inverse dal dischetto NC 02 di Nailz Craze. What about starting the week off with a nail art? Plus I’m matching the colours to today’s Italian holiday when there’s (or there was should I say) a habit of throwing buckets of water to friends. So what colours match water? Blue and green! Which also happens to be this week’s When Colors Collide’s nail art colour scheme. I created a gradient using Colour Alike holographic nail polishes in 512 turquoise and 513 aqua green. Then I stamped over it with a darker blue and two reversed patterns from plate NC 02 by Nailz Craze. Top coat and you’re good to go! Ah, quanto amo gli smalti Colour Alike! E poi questi colori sono proprio belli per l’estate. Siete d’accordo con me? Ah, I love Colour Alike nail polishes so much! Plus these colours are great for Summer. Do you agree with me? GAH, THESE ARE GORGEOUS! 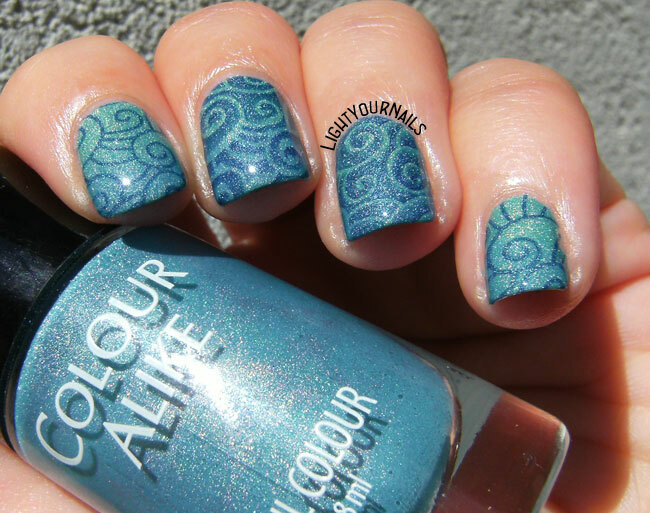 I love the colors and the stamping and everything you did here is beautiful! I've been wanting to try some Color Alike for stamping!! These weren't meant for stamping but I've always found that almost all their regular polish work. Lovely design. It's subtle but gorgeous. I love these colors and the stamping is perfect! Sure I agree! Lovely mani. This polish is amazing! I love how you used it. Gorgeous! I love these polishes together! The nail polishes are so pretty and the mani outcome is perfect! I didn't participate in this one but I love this group. I love using color combos that I may have never chosen otherwise. It pushes me out of my comfort zone sometimes! Gorgeous combination, it looks so perfect together! Yes, I agree...this colors look fantastic together!